This description covers apple jelly, but the principle is the same for a whole range of fruit. 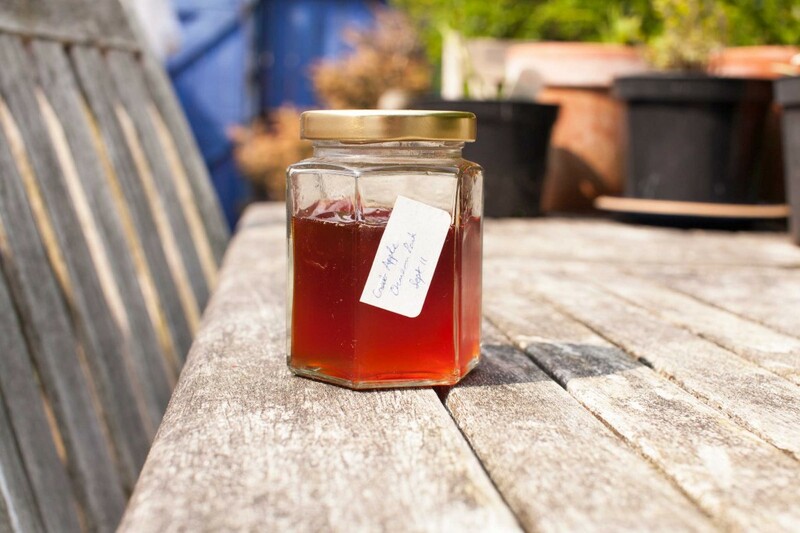 Apple jelly is the easiest because it sets so beautifully and the fruit is easy to prepare. There are two stages to making this wonderful concoction. Stage 1 is the preparation of the fruit and extracting the liquid. Take your apples, be they cooking apples, crab apples or unripe eating apples. Clean them up to avoid mud, stalks and leaves, and discard bruised or clearly over-ripe fruit. Don’t peel or core the fruit. Cut each apple up into three or four bits, unless they are the small ornamental crab apples which can be left entire. Put them in a large saucepan or preserving pan. Add enough water to enable the bits to start floating – I found that some apples are moister than others and require a bit more water, but it isn’t crucial. Bring to the boil, and then simmer until the fruit is soft and pulpy. When this point has been achieved, maybe after 1/2 hour or so, remove from the heat. Set up some device for straining the mixture through cloth. Jelly-bags can be bought and suspended from the legs of an upturned stool, and liquid strained into a bowl beneath. However, you can use anything really as long as it can act as a decent strainer. I use muslin bought from the material shop, or you could use a tea-towel or other cotton material. This could be placed inside a colander, but I use a small window frame, draping the cloth over it with an elasticised hem clipping over the edge. The finer the cloth, the clearer the liquid, but it is up to you how you do it. Strain overnight is the best, but bear in mind that the mixture will be boiling hot and you need to be careful and keep children and pets away from it. Stage 2 is the making bit. Measure out the resulting liquid and use the following guide: 1 pint of liquid to 1 lb of sugar. You can eyeball this by measuring the liquid, and then in the same container, measure about 80% or 4/5 of the same volume of sugar. Or, 1 litre of liquid to 700g of sugar. Put the liquid into the pan and bring to the boil. Add the requisite amount of sugar and bring back to the boil, keeping an eye to make sure it doesn’t boil over or go too quiet. After 5 minutes, test for a set by putting a dab on a cool plate and seeing if it develops a skin after about a minute. Repeat at regular intervals and when setting point is reached, remove from the heat. The jelly can then be potted into warmed and sterilised jam jars and sealed in the usual way. I just use screw-top jars salvaged from friends and family, but you can use cellophane and elastic band tops as well. I don’t bother with waked discs as I tend to eat it soon enough. There is no need to mature this as it is immediately ready for eating. Note that juice can be made the same way with other fruits, especially blackberries, rosehips and sloes. These all need some apple juice mixed in to ensure a good set – I use about 1 part apple juice to 3 or 4 parts blackberry and get nicely set jelly. It can also be flavoured by adding a few cloves, some cinnamon or whatever takes your fancy. WARNING Jams and jellies get really hot when cooking, so be careful as it will give a nasty scald if it lands on your skin.